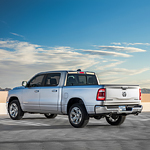 The 2019 Ram 1500 enters the auto market with several upgrades and enhancements that deserve some recognition. Three engines are available for this light-duty pickup truck, which is ready for test drives at Rio Vista Dodge Chrysler Jeep. A six-cylinder engine block with the classic Pentastar design is available in this Ram model. Having a towing rating of just more than 7,700 pounds, this gas engine runs on the all-new eTorque technology that has some elements of a hybrid system. You can extract up to 305 horsepower from this V6 engine that displaces 3.6 L during a full combustion cycle. The eTorque system is also integrated into the updated V8 HEMI engine, which has a peak output of 395 hp. Boasting a best-in-class towing capacity of 12,750 pounds, this eight-cylinder engine is mated to an eight-speed automatic transmission system. The gearbox includes the patented TorqueFlite technology for optimum shifting points on demand.